Aslan was turning two and was into robots! His mom gave us carte blanche to create a fully custom celebration, which in honor of his second birthday, we dubbed "Aslan 2.0"
We decided a modern take on the theme, done in bright colors, would fit the bill. First, we needed robot decorations and a gear-themed banner. 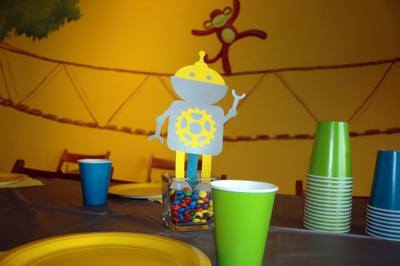 The robots were not self-standing, so we glued popsicle sticks to the back and planted them in a base of M&Ms, which just happened to be all of the colors we had chosen for the tablescape! 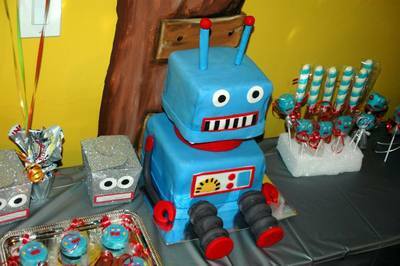 Then we called on our baker, Joanna, to put together a robot-themed sweet table, complete with an edible robot-shaped cake! We added a few more of Marie Leon's robots to the muraled tree tops and topped it off with color coordinated balloon bouquets. 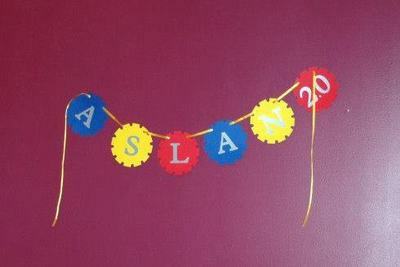 Each little guest left with a custom, Aslan 2.0 gift bag.